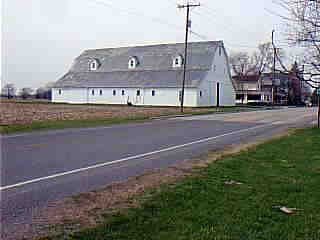 This barn, once used as a livery stable, is now used to store farm equipment. The entire village is surrounded by farm fields such as those shown here. It is 10 miles to the nearest towns of any signifiant size, Van Wert, Delphos, and Spencerville. Residents used to rent horses and buggies at this barn for travel to these and other nearby places.